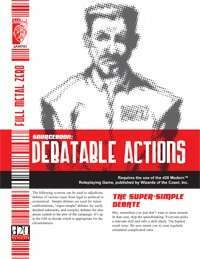 Debatable Actions is a PDF that focus on the arena of resolving conflict without violence but with words. The PDF creates three systems can be used to adjudicate debates of various types from legal to political to economical. Simple debates are used for minor confrontations, "super-simple" debates for easily decided sidetracks, and complex debates for situations central to the plot of the campaign. It's up to the GM to decide which is appropriate for the circumstances. This 13 page PDF is just the sort of thing needed for GMs to add depth to any great d20 Modern campaign world, including Haven: City of Violence and Haven: Full Metal Zero. Nobody does the d20 Modern espionage and spies better!!! This title was added to our catalog on December 14, 2006.